Note: I am going to take some suggestions for post topics in the future. This post comes from a Twitter poll I ran the day before yesterday. The Yamanote Line in Tokyo is a ring. Trains go around the ring as on any other circular rail line. However, the line is not truly circumferential, since it serves as a north-south trunk through Central Tokyo. In that way, it contrasts with fully circumferential rings, such as the Moscow Circle Line, Seoul Metro Line 2 (see update below), and the under-construction Paris Metro Line 15. It’s really a hybrid of radial and circumferential transit, despite the on-paper circular layout. In previous posts I’ve attacked one kind of mixed line and given criteria for when another kind of mixed line can work. In this post, I’m going to discuss the kind of mixed line Yamanote is: why it works, and in what circumstances other cities can replicate it. 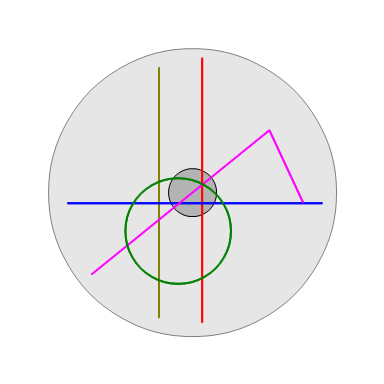 The red and blue lines are radial. The other three are hybrids. The yellow line is radial, mostly, but skirts city center and acts as a circumferential to its west; this kind of hybrid is nearly always a bad idea. The pink line is radial, but at the eastern end bends to act as a circumferential at the eastern end; this kind of hybrid is uncommon but can work in special cases, for example if Second Avenue Subway in New York is extended west under 125th Street. The green line is a Yamanote-style ring, offering radial service through city center but also circumferential service to the south and west. On this map, the green line ensures there is circumferential service connecting what are hopefully the major nodes just west and south of city center. It doesn’t do anything for areas north and east of it. This means that this line works better if there is inherently more demand to the west and south than to the east and north. In Tokyo, this is indeed the case: the Yamanote ring offers north-south circumferential service west of Central Tokyo, through what are now the high-density secondary business districts of Ikebukuro, Shinjuku, and Shibuya. East of Central Tokyo, the only really compelling destinations, judging by subway ridership, are Oshiage and Asakusa, and neither is as big as Ikebukuro, Shinjuku, or Shibuya. Toyosu has high subway ridership, but is close enough to the water that it’s hard to build a circumferential through it. Such a mixed line also becomes more useful if the radial component is better. The radial line can’t extend very far out, since the line needs to form a ring, so it should connect to very high-density neighborhoods just a few stops outside city center, or else provide additional service on an overloaded radial trunk. The Yamanote Line benefits from looking less like a perfect circle and more like upside-down egg, with two elongated north-south legs and two short (one very short) east-west legs; it extends its radial segment slightly farther out than it would otherwise be. In Tokyo, of course, all rail lines serving the center are beyond capacity, so the Yamanote Line’s extra two tracks certainly help; in fact, the two radial lines going north and south of Tokyo Station on parallel tracks, the Tohoku and Tokaido Lines, are two of the three most overcrowded in the city. (The third is the Chuo Line.) There’s even a dedicated local line, Keihin-Tohoku, covering the inner segments of both lines, making the same stops as Yamanote where they are parallel, in addition to the more express, longer-distance Tokaido and Tohoku Main Line trains. Finally, there should not be radials that miss the mixed line; this is always a danger with subway lines that are neither pure radials nor pure circumferentials. Yamanote avoids this problem because it’s so close to the water at Shimbashi that the north-south subway lines all curve to the west as they go south, intersecting the ring. It’s actually the east-west lines that cross the Yamanote Line without transfers, like Tozai and Hanzomon; the north-south lines intersect the line with transfers. The obvious caveat here is that while the Yamanote Line functions very well today, historically it did not originate as a circumferential in an area that needed extra service. It was built as a bypass around Central Tokyo, connecting the Tokaido and Tohoku Line at a time when Tokaido still terminated at Shimbashi and Tohoku at Ueno. Tokyo Station only opened 30 years later, and the ring was only completed another 10 years after that. Shinjuku only grew in the first place as the junction between the Yamanote and Chuo Lines, and Ikebukuro and Shibuya grew as the terminals of interwar private suburban railways. When the line opened, in 1885, Tokyo had 1.1 million people; today, the city proper has 9.5 million and the metro area has 38 million. The early rail lines shaped the city as much as it shaped them. Nonetheless, with the economic geography of Tokyo today, the Yamanote Line works. Even though the history is different, it’s a useful tool for mature cities seeking to build up their rail networks. Provided the principles that make for the Yamanote Line’s success apply – stronger demand for circumferential service on one side of city center than on the others, demand for supplemental inner radial service, and good connections to other lines – this layout can succeed elsewhere. Waterfront cities should take especial note, since they naturally have one side that potentially has high travel demand and one side that has fish. In those cities, there may be value in running the radial closest to the shoreline in a ring with an inland line. This does not mean that every waterfront city should consider such a line. On the contrary: non-examples outnumber examples. In Toronto, using two mainline tracks and connecting them to a ring to provide subway relief could have worked, but there are no good north-south corridors for such a ring (especially on the west), and the only good east-west corridor is Eglinton, which is being built incompatible with mainline rail (and has too much independent value to be closed down and replaced with a mainline link). In Chicago, the grid makes it hard to branch lines properly: for example, a ring leaving the Red Line heading west at Belmont would necessary have to branch before Belmont Station, cutting frequency to the busiest station in the area. Plans for a circle line from last decade also faced limited demand along individual segments, such as the north-south segment of the Pink Line parallel to Ashland; ultimately, the planned line had too small a radius, with a circumference of 16 km, compared with 34.5 for Yamanote. In Tel Aviv, there just isn’t any compelling north-south corridor outside the center. There are some strong destinations just east of Ayalon, like the Diamond Exchange and HaTikva, but those are already served by mainline rail. Beyond that, the next batch of strong destinations, just past Highway 4, is so far from Central Tel Aviv that the line would really be two radials connected by a short circumferential, more the London Circle Line when it was a full circle than the Yamanote Line, which is just one radial. So where would a Yamanote-style circle be useful outside Tokyo? There are semi-plausible examples in New York and Boston. In New York, it’s at the very least plausible to cut the G off the South Brooklyn Line, and have it enter Manhattan via the Rutgers Street Tunnel, as a branch of the F, replacing the current M train. There is no track connection enabling such service, but it could be constructed just west of Hoyt-Schermerhorn; consult Vanshnookraggen’s new track map. This new G still shouldn’t form a perfect circle (there’s far too much radial demand along the Queens Boulevard Line), but there are plausible arguments why it should, with a short tunnel just west of Court Square: namely, it would provide a faster way into Midtown from Williamsburg and Greenpoint than the overcrowded L.
In Boston, there is a circumferential alignment, from Harvard to JFK-UMass via Brookline, that can get a subway, in what was called the Urban Ring project before it was downgraded to buses. Two of the busiest buses in the region, the 1 and 66, go along or near the route. An extension from Harvard east into Sullivan and Charlestown is pretty straightforward, too. Beyond Charlestown, there are three options, all with costs and benefits: keep the line a semicricle, complete the circle via East Boston and the airport, and complete the circle via the North End and Aquarium. The second option is a pure circumferential, in which South Boston, lying between East Boston and JFK-UMass, would get better service north and south than west to Downtown. The third option cuts off East Boston, the lowest-ridership of the radial legs of the subway, and offers a way into the center from South Boston and Charlestown. Of note, neither New York nor Boston is a clear example of good use of the Yamanote-style ring. This style of mixed line is rare, depending on the existence of unusually strong circumferential demand on just one side (west in Boston, east in New York), and on the water making it hard to build regular circles. It’s an edge case; but good transit planning revolves around understanding when a city’s circumstances produce an edge case, in which the simplest principles of transit planning (“every subway line should be radial or circumferential”) do not apply. Update 5/16: commenter Threestationsquare reminds me that Seoul Metro Line 2 is the same kind of ring as Yamanote. The north leg passes through City Hall, near the northern end of the Seoul CBD, providing radial east-west service. The south leg serves a busy secondary commercial core in Gangnam, Tehran Avenue; Gangnam Station itself is the busiest in Seoul, and has sprouted a large secondary CBD. Another interesting example (that may need to wait 30 years to work) is in Houston. The CBD is the center of the network, but there is a major node to the south (Texas Medical Center) and one to the east (Uptown.) There is little of note north or east of downtown. A ring through these places could work, particularly if commuter rail, and IAH express line, and/or Texas Central open, funneling traffic into Northwest Transit Center. You mean Uptown is to the west and not to the east, right? But yes, Houston seems like a good candidate for this kind of travel pattern. The one caveat is that the University Line alignment branches before the Medical Center. That line’s all but canceled, and a reroute via Holcombe is possible, but there’s a lot more stuff on Richmond than on Holcombe. If one lived in Tokyo one would really prefer to live within walking distance of a Yamanote Line station. I worked briefly at the Cancer Hospital/Centre in Otsuka which is just one or two stops north-east of Ikebukuro. Even though geographically it is a fair way from the centre, using the YL was excellent (and I only had to use if off-peak so even better). And you could choose the eastern or western routes; the western route passes thru all the other big centres but the eastern route is less crowded and a more peaceful journey. Like the new circumferential Metro lines in Paris, one doubts they could be fully justified on today’s distribution of travellers (it may yet remain quicker to take a radial into the centre and another radial out to wherever one works etc). But just as the RER over its forty years has shaped where banlieusians live and work, the circumferential lines will do the same until at some future time, it will efficiently serve a lot of commuters and take pressure off those heavily trafficked radial lines. This is using mass transit as an urban planners tool. It would have made sense to have done these kinds of things much earlier but spending this kind of money only becomes politically possible when the overall system passes some pain threshold. The difference is that no first-world city today can reasonably expect a factor-of-30 growth in population in the next 100 years. Even then, the Yamanote Line wasn’t 100% a shaping line – it also served. Of note, there are private railways all over suburban Tokyo, with a bunch of off-CBD terminals: Ikebukuro, Shinjuku, Shibuya, Meguro, Oshiage, Asakusa. The Ginza Line connected Asakusa to Central Tokyo starting in 1931, and was jam-packed from the start, so service at Asakusa wasn’t any worse or less popular than commuter rail service at Shinjuku, Ikebukuro, and Shibuya. But ultimately, Tokyo suburbanized to the west more than to the east, so the stations pointing west became more popular than the ones pointing east. This could be an artifact of too much of the east being water. It could also be suburbanization starting with the wealthier side of the city (relatedly, there was far more rail ridership at Saint-Lazare than at Lyon or Est before the RER opened, and it took the RER A to drop Saint-Lazare’s ridership below Nord’s). I also disagree with you on Grand Paris Express. Paris has a shortage of good circumferential transit. The existing options are very crowded: M2 and M6 are fourth and fifth in per-km ridership (after M4, M1, and M14), T3 is probably the busiest tram in the world both in absolute ridership and in per-km ridership (15,000/weekday, comparable to the NYC subway), T1 and T2 are less busy than T3 but are still over-10,000-per-km workhorses. This suggests that M15 is justified based on current travel patterns. M14 is very busy and its extensions should be useful as well. M17 and M18 I’m skeptical about – M18 especially seems like a sop to the Fillon-voting favored quarter set. To be more precise, no first world city with a currently large population can expect factor-of-30 population growth. There are still places that could be the next Phoenix–St. George, UT; Victoria, BC; Eugene, OR; Fresno, CA; Kahului, HI; etc. I was thinking more about how all those desirable first-world cities have both big transport issues and housing shortage/affordability issues. Radial routes are pretty much saturated in these cities so circumferential routes can bring transit to a lot more people as well as creating desirable TOD around new stations on their routes. Re Paris I cede the argument, though I certainly wasn’t arguing against building them. However I’m not sure using T1 thru T3 proves the case for others. T3ab obviously is within Paris while also serving the ≈2m residents (on top of Parisians) within walking distance in the Petite Couronne; you can hardly get more dense city anywhere. (As long as one’s Navigo card works then I can understand people substituting the pleasant tramway instead of one or even two changes on the Metro; I’d have done it myself when I lived at Cité Universitaire instead of taking RER-B to Denfert-Rochereau, then M6 to Place d’Italie then M7 …). Both T1 and T2 serve already big populations and/or work centres–of St Denis, La Defense etc–which is why they were built back in the 90s, ie. the need was pre-existing. My point was that the proposed circumferential lines won’t have such density or centres to begin with, as by definition, they are further out. In fact this is what you are saying about M17 & M18. It might take time to build ridership while building population. While M15 is on the outer edge of the Petite Couronne so, yes, it has a dense ready-made set of riders in place. I’m not so familiar with the areas that M17 & M18 traverse but if they are up-market areas then there is no reason not to encourage them to have TODs too and leave their BMWs at home. (The petite bourgeoise have to live somewhere and this is better than sprawl …). BTW, don’t tell me that Fillon has his Paris base in Versailles 🙂 He’ll probably have to move closer to La Defense to earn the big bucks to repay that €1 million. M18 connects the Hauts-de-Seine suburbs with the southern suburbs, like Orsay. M17 is not upmarket at all – it’s a radial-ish line paralleling the RER B to CDG, passing through new areas to be developed rather than through Aulnay, because it’s better to build a long greenfield tunnel than to quadruple the RER B/D tunnel and create more capacity that can be used for both commuter service to Seine-Saint-Denis and airport service. M16 is a circumferential going just north-south farther east than the eastern leg of M15; it’s there because, while the western leg of the circumferential is obvious (go through La Defense), there are two options for an eastern leg, and the region decided to build both. The problem with TOD-ifying the M18 area is that it’s kind of out of the way of radial transit. Unless the region is trying to turn La Defense into its new center, which it isn’t, any such TOD would be poorly-served in the direction people most want to go in. It’s better to look for areas where existing radial transit is undercrowded. This means commercial TOD at Les Halles (because peak morning crowding is westbound from Les Halles to Auber) and residential TOD on the RER A and soon to be RER E west of La Defense. Neuville-Universite is mostly undeveloped, there are development sites next to Acheres-Ville, and there’s low density in Le Vesinet, Maisons-Laffitte, and all the stations west of Poissy. Tozai and Hanzomon don’t totally lack connections to Yamanote; they both stop at Otemachi Station, which if I remember correctly, has an underground walkway connecting to Tokyo Station. They say that one reason for so many major stations on the Yamanote (Shinjuku, Shibuya, Ikebukuro, Ueno, Tokyo, Shinagawa) is that the non-JR railways were banned from constructing anything inside the Yamanote. Yeah, the ban mattered… but only insofar as it put all the private railways’ terminals on one line. Those railways weren’t going to get to Central Tokyo anyway – evidently, on the east, they go to Oshiage and Asakusa and not to Tokyo. Today, with extensive tunneling, they only managed to get the Tsukuba Express to get to Akiba – continuing south to Tokyo was too hard. Exactly how Tokyo is envisioning a Tsukuba Express extension to a New Tokyo station between Tokyo station and Nijubashi-mae, and beyond, through service to Ginza-Waterfront. This is in conjunction with the Downtown Direct Access line for Keisei-Keikyu bypassing Asakusa line, replacing Keisei Ueno terminus to improve connection to the city center for Narita Airport. JR’s Haneda Access competing for NRT-HND link is markedly less challenging as a catch-up. Hanzonmon line platform’s proximity to Marunouchi line means the subway matters less than Tozai line. Location within Otemachi station is everything for ease of transfer. On a much smaller scale, this pattern can occasionally be seen in bus networks. If there are two CBD-radial lines that justify themselves, it is sometimes worth interlining the outer ends of the radial lines in order to create a direct route within the suburban neighborhoods, perhaps connecting residential areas to schools or grocery stores without necessitating a connection in the CBD. The marginal cost of the extra circumferential service is anywhere from low to none or a slight benefit, especially if the ring service uses up more time in a clockface schedule or lets the bus operators have access to better restroom facilities. With respect to the yellow line, that pretty well describes the Broadway Subway, or would you regard Central Broadway as sufficiently core? Central Broadway is core enough that the 99-B + 9 smoked the 98-B in ridership, and are still not far behind the Canada Line despite being buses. 1. Routing intercity trains through Eastside Access, Grand Central, and Hoboken, rather than Penn Station. 1. The tunnel would be very expensive. 2. You would need to build long rail lines on both sides to reach the Bering Strait. 3. Russia and the USA have different track gauges, so you would have to transship cargo from one train to another, exchange the bogies or use variable gauge wagons. Conclusion: the tunnel would be pointless. Not that that has stopped the Russians or the Chinese getting their crayons out. If you had a standard gauge link through to China I presume that run-through would be relatively straight forward no? This would be much more valuable than a connection to the Russian network. I don’t know about the compatibility of Chinese and North American loading gauges, trainline braking, or draft gear, but I presume that it would be easier to figure out than than the European through-trains that they’ve run lately. Yes, and so does Great Britain, but we know that relatively little foreign rolling stock is going to successfully operate there. If Canadian National train of double stacked containers or tri-level autoracks departs Chicago for Guangzhou, will it clear platforms or passing trains? Will it strike bridges, or arc catenary? Would a China Railway train going the other direction do the same? Is equipment sufficiently similar that a Chinese locomotive can haul US equipment without extensive modifications, or vice versa? Can US and Chinese equipment be trainlined together, or will brake or coupler standards prevent that? The Chinese loading gauge is slightly wider than the American one. A double-stack intermodal train will fit both. +1 for airport closures! Given the real estate value of BOS, LGA, SFO, OAK, SAN, and DCA, as well as the difficulties in connecting them to mainline rail, I really would love to hear Alon’s optinions of what should be done in the future. …are you proposing to close Boston’s only airport, and all airports in the Bay Area? ….. Mirabel worked out so well…..
Re SFO, DCA, and LGA: I think they should all be closed. Expansion should happen at Oakland (or a brand new airport in Tracy, if high speed rail were to be built via Altamont) for SFO. DCA should be closed. Dulles has plenty of capacity. LGA should DEFINATELY be closed, with EWR/JFK expanded. Re SAN: I think a cross border airport like this: https://drive.google.com/open?id=1DNOoa7etkVZGnjW57HjKrbG4lug&usp=sharing would be wonderful, would cost about 4 billion to build, and the sales prices of SAN could offset that entirely, not to mention the advantages of having a single hub for a 5 million person region that ISNT IN DOWNTOWN. Re BOS: A new airport could be built near Worcester, along a new Inland HSR line. I estimate it would cost about 5.5 billion to build this: https://drive.google.com/open?id=1oVEhqkUQm5U71TrCiX4qKWqKGt0&usp=sharing and Logan Airport could be sold (as developable land) for about 2 billion. I think the 3 billion loss would be worth it because of the relief in housing it would provide Boston, the economic stimulus it would provide Worcester, and the train-rail connections that would put over 5 million people within 1/2 and hour of it by rail. I am not familiar with the details of those cases but I agree. And Eric’s halfway house is a recipe for disaster, and solves nothing. The reason why Mirabel failed is that they never closed the old airport. I agree about Dulles but they should have closed Wash National (only kept open because of the politicians) and then they would have built good transit, instead of only 50 years late. Berlin is closing two of its three airport, expanding the remaining one into a mega-airport with superb transit links while the ones being closed will be a mix of new housing and green space. Sydney (Australia) is the worst of all worlds. Not only was the single airport, the biggest in Australia, KSA, privatised to a single entity (SAC), they were given first-rights to any new airport within 100km of the city. (Someone should have gone to jail for this corruption but of course it was politicians: the first CEO of SAC was the head of the Prime Ministers (Howard) Office when the privatisation was set up. He moved directly from the PMO to head of SAC, within two weeks IIRC.) SAC instantly double or tripled every charge they could including landing charges, retail leases and parking charges (most expensive car parking in the world). But 20 years later when air-access desperately needs expansion and it is not possible on the KSA site, after two years of “consideration” (of its monopoly rights) it has declined to develop the new site (in western Sydney, reserved more than 30 years ago where it can operate 24/7). Thus the government will build WSA (Western Sydney Airport) for $5 billion (plus about $4bn in new roads; the planned rail link is on ice! probably because they know they’ll need that parking income) and it will probably be a white elephant for 20 years because it will only get LCC flights. None of the major airlines (except perhaps Emirates; even Qantas has stated they will only base their LCC Jetstar (recently voted the worst LCC in Asia-Pacific) at WSA thus freeing slots for premium flights from KSA). Oh, and because everyone knows WSA will not relieve KSA enough (or at all), SAC and its proxies (some conservative members of parliament) are stepping up their demand that the curfew on KSA (it is right in the middle of suburban Sydney) be relaxed! Americans will be crazy if they ever privatise their international airports. The only rational decision for very big cities is to create one mega-airport–which generally will need to be fairly distant to the city) and then build excellent transit to it. The successful models for this would be Paris-CDG, Hong Kong International and (eventually) Berlin. But the vested interests and inertia to overcome is usually too much for government (either due to timidity or collusion or NIMTOO, Not In My Term Of Office). Berlin-Brandenburg is a boondoggle and a giant waste of money for a city that really wants to act like it’s more economically important than it is. The billions of euros invested in it should have instead gone to adding more housing (Berlin’s only building 3 units per 1,000 people, and in past years it built even less). And the things you guys are proposing in this thread are even worse, because Berlin-Brandenburg is at least in approximately the same location as Schönefeld, not out in the sticks near Worcester or Tracy. Nor is there a shortage of developable land in and around Boston. The area is full of triple-deckers, which can be redeveloped as mid-rises at little cost. This would have the advantage of building near subway stations, like Davis and Porter, and not at an airport that’s notably not next to the subway but is next to a freeway. The highest rail access mode share I’ve seen for any airport is about 55%. This is obtained in Zurich (which is close to city center and has a ton of S-Bahn and tram service) and Narita (which is inconveniently far from city center and is in a metro area where the rail mode share for work trips is 60%). Workhorse airports connected to HSR, like Frankfurt and CDG, are in the high 20s or low 30s. In both cases the majority of the mode share is local rail, and not HSR. Bottom line: proximity to a city center matters a lot, for the 90% or so of fliers who are not connecting to HSR. My personal fantasy for the Northeast Corridor involves megahubs every 120-ish miles, serving 10-15 million people each, all along a HSR line, though I know it isn’t that realistic. In some ways I think it is inevitable. The airways and airports are not only getting too crowded but have long been an awful means of travel (about 2 decades now; remember when it used to be fun?). Just look at all the horror-stories captured on video in the just the past month: I don’t think they are anything new, just that camera-phones and social-media has made them public. Also, while it is easy to be pessimistic about HSR in the US, I reckon it will transform once the first one is built and widely used. Like everywhere else in the world it will be wildly successful and even Americans will be converted (as any Americans who use HSR in Japan, China or Europe are converted). It is beyond irrational that a proper HSR (and I mean >300 kmph) doesn’t serve the NEC (and extend that to Atlanta). The fact that Brandenburg turned into a financial fiasco has nothing whatever to do with the issue. The decision to amalgamate the three airports into one was still correct, especially given how decrepit all three were. (But note that at €6.8 billion for a new runway (ie. adding to the one already at Schönefeld) and a totally new terminal, it is still at most half, maybe one third of the proposed £18 billion for the third runway and new terminal for Heathrow. Also that it will be the 3rd or 4th airport in Germany.) It may not be a really long way out but it is further out than Tegel and Templehof. In fact it is just outside the Berlin city boundary. As to the HSR comments, I was merely referring to the inevitability of having a HSR network that may well link international airports. Assuredly a lot of those 92 million flying into Atlanta airport are not destined for Atlanta. Clogging the roads everywhere too. As the old BR (British Rail) saying went: “Let the train take the strain”. Ya ain’t gonna build an airport in Princeton. The chances of building an airport anywhere in New Jersey are somewhat the same as having the land cleared by Martian invaders. Nelson Rockefeller and the MTA went ahead and built something similar. Stewart Airport has been a rip snorting success. At making a state park in Rockland County. Proximity to the city center matters, but only in travel time, not actual distance. For example, from SFO to Downtown San Francisco, currently takes 32 minutes. With HSR and an airport in Tracy, a dedicated Airport Express could provide service to Livermore (10 minutes), Union City (20 minutes), Redwood City (30 minutes), Millbrae (40 minutes) , and Transbay Terminal (50 minutes), which isn’t much worse than BART for the city center, and WAY better for the rest of the Bay Area. The same goes for Boston. The current Silver Line trip from South Station to Logan Airport takes about 20 minutes. A MBTA EMU, stopping at Worcester Airport, Southborough, Framingham, Natick, Wellesley, Riverside, Back Bay, and South Station wouldn’t take more than 40 minutes. Moreover, regional rail NEHSR linking the airport to places like Providence, Springfield, Hartford, Storrs, and Pittsfield would put millions of people a short train ride from the airport. Overall, I think the marginally longer trips to the city center are made up for by HSR links to other cities and redevelopment opportunities. Indeed, I would expect such projects to result in a higher rail mode share, because rail would become the fastest way to reach the airport in most scenarios. Okay, so you’re replacing a 20-minute connection with a 40-minute one (actually more like an hour, because there’s not enough demand for express service on the Worcester Line – the airport itself isn’t enough of a trip generator). That’s not a small thing. It’s better for Hartford, Springfield, and Worcester, but Boston is comfortably larger than all three combined, especially for arriving passengers. That’s why Logan is a major international airport and Bradley isn’t. Providence is better-connected to Boston than to Worcester and always will be. While it would be expensive (though redeveloping EWR, PHL, LGA, TTN and JFK? may be enough to finance it), and it would run into NIMBY opposition (probably less than projects like Heathrow’s third runway), it would be doable. …you’re spending all this money and political capital on a new airport and it’s not even on the NEC? I think 20 minutes is reasonable (and besides, if you close Logan Airport, what are your alternatives). PS. A Worcester Line Express is part of the MBTA Indigo Line plan, which replaces all the urban stops of the regional rail network with frequent DMU (EMU?) trains. I think this could cover all the stops between Wellesley and Back Bay. A Worcester Line express may be on the MBTA plan, but it doesn’t make it good transit. The MBTA had a plan to rebuild Auburndale that would make service worse (the platforms in Newton only serve one of the two tracks, and the plan would’ve moved the Auburndale platform to the opposite track of the one used by the other Newton stations), until we at Transit Matters yelled at them about it. The Heart-to-Hub plan misses all the ridership in between. I think a strength of the plan is that it isn’t on the existing NEC. Rather, it is on the West Trenton Line, which would be repurposed for faster HSR service and some regional rail, freeing up capacity on the busy NEC for NJT/SEPTA service. A Worcester line express isn’t an express, skip-stop train–rather, it is a regional line that doesn’t serve every urban/inner-ring-suburb station, which are instead served by a HRT equivalent–just like the LIRR in Queens. Indeed, Boston has examples of this–the NEC and Orange Line, the Red Line and Old Colony lines. Running HSR on the West Trenton Line is a really bad idea. Tight curves in the transitions to the line and in SEPTA territory, no Trenton… what’s the point? Actually, the southern entrance to the line eliminates a curve that is used to get onto the NEC, and route around Newark is very similar to the NEC. Besides, in the circumstance of a Hopewell area airport, I think Trenton shouldn’t be a HSR stop. You mean Zoo Junction? It’s overrated as a slow zone. No. The one next to the Woodbourne SEPTA station. That’s not on the NEC, no need for any HSR train to come near it. Sorry. I wasn’t clear. I was thinking that certain services–Keystone?–could take that curve and go to Trenton, but now I’m thinking maybe it would just be best to have an independent northwest regional rail arc around Philadelphia. MagLev Train: 220 km to 300 km (420 kmph to 500 kmph). The Metro train estimates come from Paris RER-B and HKI’s Airport Express. The ICE train range is based on Gatwick Express (30m to cover its 47.5 km) and theoretical calculations using higher-speed trains. Note that with MagLev the entire NEC is within a travel time deemed acceptable for one of its largest airports. That is what I was referring to by a possible future scenario. And if you think it is too expensive then just add up the costs of all those roads (and all the unnecessary upgrades, widenings, new freeways etc) built specifically to serve airports and it would easily pay for the rail link. Citing travel mode shares is merely to lock our future into past poor practices. In fact if you read Neuromancer (published 1984) his travel thru the Sprawl (=NEC) pretty much matches my scenario. It will arrive and only depends on how bad it needs to get before Americans finally do the inevitable and come to their senses. And before ‘dacker goes into attack mode, consider that you can now catch a TGV from Paris-CDG to Lyon that covers the 460km in 1h55m (which equates to 160km in 40m), so no, none of this is science fiction except for those Americans-without-passports! Note that Paris-London is very close to exactly double Washington to NYC. Lots of rich people is the point. Who want to go to New York City from Pennsylvania and Philadelphia from New Jersey and Boston and Washington DC from either of them. And Harrisburg and Hartford and Pittsburgh and Cleveland and Charlotte and ….. I can think of umpteen different service patterns. The software that looks like a reservation system, from the outside, can suggest which would be best. I am not so extreme (no megaproject airport in NJ is happening). Closing LGA is a no-brainer, wirth lifting the weight restriction on Teterboro (to make a London City-esque NYC high-end airport), and replacing short-distance flights with long-distance flights at EWR to pick up the slack. It’s unfortunate that JFK isn’t really accessible, but I don’t know that you can ever get rid of it (lots of people want to go to NYC). PVD is the more ideal airport for boston, over Worchester, improved regional rail could provide an acceptable connection time, and it’s not merely a matter of there being other property to develop/redevelop in Boston, Logan is in a site that would be especially valuable for a developer. I agree HSR connections to airports are relatively unimportant, it’s really more regional rail (S-bahn) gig. I’m a bigger fan of putting PHL on the new NEC alignment than trying to replace it (and it could serve somewhat as an alternative airport for NYC, more than it already does), and it’s the big advantage that BWI, EWR, and PVD have over Dulles, JFK, and Logan when it comes to future usefulness. As far as bay area airports, I agree with a major airport/intermodal center around Lathrop or Tracy if Altamont happens (more to serve everywhere east of Dublin, North of fresno, south of Eugene, east of reno, rather than the core bay area), but I think OAK and SFO’s operations should be consolidated onto a new airport on the site of the Naval Air Station Alameda (since apparently nothing else is happening there), freeing up the current sites of OAK and SFO for development. The fantasy would be for the new transbay tube to service the new SFO Alameda directly en route between SF/points south (Current caltrain, future HSR) and Oakland/points east (Altamont regional rail, Capitol Corridor, and HSR), but this needn’t ever happen to make Alameda a viable replacement. As far as the other bay area airport (SJC, which really should be re-named “silicon valley international airport”); CAHSR would likely mean you’d see ~10 daily flights between the LA area and SJC, rather than the current ~50, and those 40 (at least) could be replaced with flights from the rest of the country, and the rail connection is already there (caltrain/HSR). I agree largely with Car(e)-free in LA’s San Diego/Tijuana airport plans, though I’d go for two parallel runways (similar design to BKK, HKG), with a mexican international/connecting airside terminal, and US international/domestic terminal. One advantage here would come from its unique international nature- as the hub for Asia-Latin America air traffic that wouldn’t require attaining an American visa to transit. Oh, and oodles of duty-free shopping. When it comes to the idea of hubs at regular intervals in the broader NEC, I disagree with the viability of a Danbury or Princeton megaproject, and I also think there’s a clear gap between Charlotte and BWI (I’d say that something just south of Petersburg, along future regional rail between the piedmond, hampton roads, and NoVa, would be a good idea). Just responding to the last paragraph: the reason there’s no major international airport between Dulles and Charlotte is that there is no large enough city between them. Raleigh, Hampton Roads, and Richmond aren’t exactly compelling global cities. I don’t even know what’s going to happen to Charlotte, in the wake of the US-AA merger. That’s true. Though there are at least 6,000,000 people who would be within coach/driving/regional rail distance of a petersburg airport, versus the current amalgamation of intermittent puddle-jumper flights everywhere between Charlotte and Dulles. That may not be enough. Re SFO, DCA, and LGA – rather than closing, I think they should be converted to single-runway airports, with the remainder of their area used for redevelopment. The remaining airports would be small downtown-ish airports like London City, with the bulk of traffic going to more remote airports. Re SAN – there are plans to rebuild the terminals on the north side of the airport, next to the LOS-SAN rail corridor. Tijuana can provide more capacity, but an airport located in the US is still necessary. Re BOS – there is no alternative with suitable capacity. And while the runways are close to downtown as the bird flies, they stick out into the ocean in ways that remote transportation-wise. Better to redevelop the areas southeast of downton. Alon, not sure if it is just my end but my last post is extremely weird. Please feel free to clean it up if it really is the mess it looks like from here. I think you copy-pasted the entire thread? I deleted the copy-pastes and kept your actual comment plus the tidbit of mine that you were replying to. What happens occasionally is, that if I leave a half-written reply on-screen for too long, it won’t post (presumably due to additional posts which mess up the “queue”). Then I have to refresh the page, meanwhile cutting and pasting the comment; but honest I only select the text inside the box–one can see it highlighted; well that’s my story). As it happens that statement is true (Paris-London is also 460 km) but I really meant to write Paris-Lyon. Paris-Lyon is 400 km, NY-DC is 360. Arrgggh. My NY-DC figure is apparently miles (226miles = 360km). I suppose it will take as long, or longer, before the US finally joins the modern world and goes metric! As it happens I saw an interview on PBS-Newshour last night (or Thursday?) in which an expert on something or other was responding to a question and he struggled a bit then shrugged his shoulders and said he was only able to give answers in kilometres, and proceeded to. For a while in the past decade I began to think the US was getting enlightened when I noticed in some shows like CSI and other current tv programs, the characters were using metric (distance, weight etc) … but it turns out they actually make two versions (maybe more?) I presume because of the large export market? But Paris-Lyon keeps coming up as 460 km (from train websites though I suppose that doesn’t preclude them being lazy and giving the road distance?). (I’m not at home where I could check this more thoroughly; seriously, the internet is such a mess sometimes…). Oh and in my original comment while I said: “you can now catch a TGV from Paris-CDG to Lyon that covers the 460km in 1h55m (which equates to 160km in 40m)”, one could have said that the entire NEC would be accessible in that time using MagLev. #11 (or really #1): Feasibility assessment of MagLev for NEC. The NEC is uniquely unsuitable for maglev, which is already not a great mode of travel in the first place. Sure. That can go on my wishlist. Why exactly? I don’t advocate for it now, but the place in the world most similar to the NEC is the Tokaido Corridor, in which, 60 years after the Shinkashen was first built, Japan is building a maglev to provide express service and increased capacity. 1. 500 km/h trains in Japan need extensive tunneling under the mountains. Maglev actually reduces costs, since it permits higher superelevation; I don’t know the capabilities of JR-Maglev there, but Transrapid is capable of 4.3 m/s^2 lateral acceleration in the horizontal plane, compared with 2.5 for top-of-the-line conventional HSR (and 3.3 for fully tilting HSR, but at speeds above 300 km/h it’s a unicorn). In the Northeast, no such tunneling is required. 2. The most difficult tunneling in the Northeast is at station approaches, especially in New York. This raises the value of being able to share tracks with conventional trains for the last few km. In Japan this is less important – the urban tunneling required is flatter (longer tunnels, each less difficult than Gateway), and all the conventional lines are at capacity. 3. Tokyo and Osaka are 500 km apart. New York is 360 km away from Boston and Washington, and 140 km from Philadelphia. This reduces the value of speed in the Northeast. Boston-Washington is not a compelling enough reason to build maglev. 4. The Northeast Corridor, especially the southern half, has more compelling intermediate stops – Newark, Philadelphia, Baltimore. (In the north, that’s New Haven and Providence.) Other than Nagoya, which is on the Chuo Shinkansen, the most compelling intermediate metro regions on Tokaido are Shizuoka and Hamamatsu, which are a lot smaller. 5. The Chuo Shinkansen theoretically has interesting cities beyond it: Hiroshima and Fukuoka to the west, Sendai and Sapporo to the north. The only really interesting city south of Washington that could be served by maglev is Atlanta (Miami and Orlando are too far). North of Boston, there’s nothing. 6. Tokyo has 38 million people, Osaka 17, Nagoya 9. New York has 23, Washington 9, and Boston and Philadelphia 7 each. MRJ: No, Maglev doesn’t need tunneling. The Japanese have chosen this approach for various reasons some of which are probably quite unrelated to anything technical. Not least lack of space/ROW on their current Shinkansen routes. I doubt they could double-deck a maglev above Shinkansen because there would be too many situations where the Shinkansen has to already squeeze under roads and other rail tracks etc. 2. The most difficult tunneling in the Northeast is at station approaches, especially in New York. This raises the value of being able to share tracks with conventional trains for the last few km. MRJ: Sharing would obliterate the point of building the Chuo-Shinkansen, and you agree because “all the conventional lines are at capacity”. Not to mention mixing trains of such different speeds. Remember too that maglev can attain higher speed closer to its stopping point, and can accelerate to top speed much faster than conventional HSR. But having said all that, I suspect they could squeeze in two elevated tracks for maglev if they really wanted to; part of their logic is just part of their infrastructure cash-splash. 3. Tokyo and Osaka are 500 km apart. New York is 360 km away from Boston and Washington, and 140 km from Philadelphia. This reduces the value of speed in the Northeast. Boston-Washington is not a compelling enough reason to build maglev. .
MRJ: This argument really doesn’t stand up. But it is why I voted for this subject to be given a full proper treatment instead of this kind of superficial dismissal. If you remember from previous posts one of my reasonings is that obtaining a ROW for a proper HSR route for the NEC might ultimately mean doing what the Chinese have done on routes linking some of their east-coast highly congested routes: go elevated almost all the way. The 164-km long Danyang–Kunshan Grand Bridge on the Beijing-Shanghai route is the longest in the world (and the line has the second and third longest in the world too) is half those distances you cite. If any HSR gets built I think you will agree that it needs to have its own exclusive ROW and not share lines or crossings with freight or any other kind of train. So the thing is if you choose to go elevated then why not take the next step and go for maglev, which, other than its inherent advantages, is easier to push thru on elevated tracks because it is so quiet and where it is required, it is easier to quieten with lightweight enclosures (ie. less NIMBYism; it won’t be zero but … ). 4. The Northeast Corridor, especially the southern half, has more compelling intermediate stops – Newark, Philadelphia, Baltimore. .
MRJ: Correct and this is actually a reason for deploying maglev which can have more stops with much less impact on traverse times (it can decelerate and accelerate much quicker). 5. … The only really interesting city south of Washington that could be served by maglev is Atlanta (Miami and Orlando are too far). North of Boston, there’s nothing. .
MRJ: Ultimately there will be a HSR line from Boston to Miami (via Atlanta). Maybe a link across to Montreal. NYC to Atlanta is about 1300 km (1460km driving distance) though perhaps the more relevant distance is Washington-Atlanta of about 850 km (with Charlotte at the mid-point) meaning they would be about 2h apart, less time than you would probably spend in either airport. An airport that rates the busiest in the world (unless some Chinese city exceeds it now): about 100m pax pa. The airports in the NEC handle 229m pax pa. So throw in Atlanta and Charlotte and you have ≈400m. Of course this doesn’t mean everyone will want to use the train for NYC to Miami or even NYC to Atlanta (≈3h on maglev, it would still be compelling alternative to wasting all that time in airports), but there is more than enough population (your point 6). The population and distances equal or exceed the European TGV network. This is perhaps your feeblest argument. And if you are correct then CAHSR and the Texas plan would be nonsense? So, instead of me scratching around with my guestimated distances and travel times and routes etc. why don’t you do a proper analysis? With an open mind.